ATHENS – Taxpayers in Greece are choosing not to pay their obligations in the run up and uncertainty of the upcoming elections, and the situation is leading to an increasingly desperate economic condition in the country. On June 6th the Ministry of Finance of Greece revealed that over the month of June tax collections in the country could fall by up to 10 percent compared to the same period last year. The national media has reported that some regional tax offices have seen tax collections drop by up to 30 percent since the start of May. The fall in tax collections has been attributed to the uncertainty surrounding the current political situation in Greece and whether the country will stay in the Eurozone, which has lead to some taxpayers suspending their tax payments and waiting for the results of the upcoming election on June 17th. In comparison, tax collections in Greece during the month of a national election have historically dropped, but have never fallen more than approximately 0.2 percent of GDP. 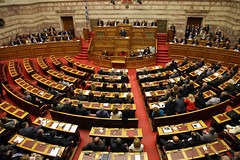 The upcoming election in Greece will be the second time Greek citizens will vote over the last six weeks. The results of the previous election, held on May 6th, were inconclusive, as political parties and voters failed to agree over the country’s economic future. Some political experts in Greece have said that the current drop in tax collections could be very significant for the country, as it is estimated that the Greek government will run out of money shortly after the election if the economic situation does not drastically improve. The government is currently considering the possibility of temporarily withholding salaries of the public sector of the national economy or withdrawing money from the funds reserved for bank sector bailouts. Greece’s economic position and ability to improve its own fiscal standing will directly affect the likelihood of it receiving any more bailout funds from the European Commission, European Central Bank and International Monetary Fund.